This week: we visit a bookmobile that's just for kids and talk to a singer from Madagascar with a Missouri connection. The Missouri Quilt Guild and the Missouri Department of Corrections joined forces for the second year of the “Fill Your Stockings” Restorative Justice program. This week’s show covers everything you wanted to know about roller derby but where afraid to ask. 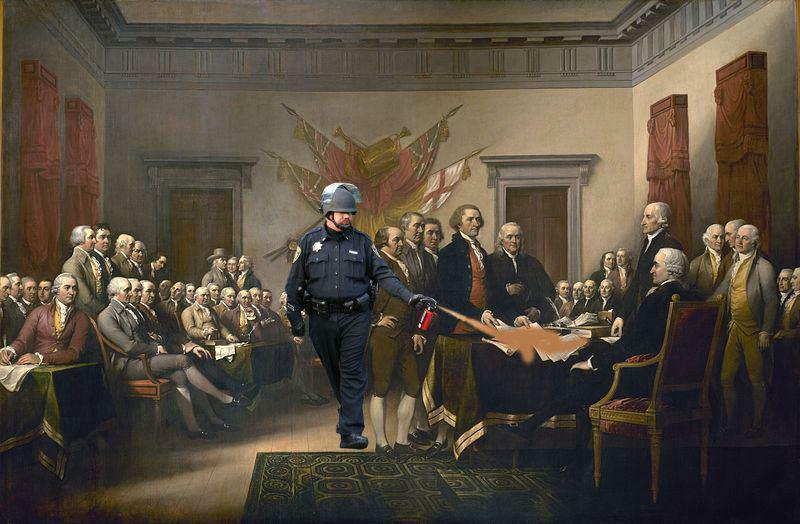 Video of a police officer dousing Occupy protesters with pepper spray was one of the top three news-related memes of 2011, according to the analysts who follow this sort of thing at Know Your Meme. Last week marked the 176th birthday of the man who many feel defined American literature. Since his 1910 death, the city of Hannibal in northeastern Missouri has become a mecca for those who appreciate Mark Twain's work - one of the few places in the world that center on literary tourism. But it's still a city - and a small town in Missouri, at that. As part of Word Missouri, a series examining Missouri's literary heritage, KBIA's Davis Dunavin went to Hannibal to explore how aficionados, experts, tourists and residents live in the shadow of Twain. We head west this week where public art can be found in places you’d least expect it. The District hosts its annual Living Windows festival Friday night in Columbia. True/False Film Festival Receives Grant from "The Academy"
The True/False Film Fest is receiving a 20-thousand dollar grant for this year’s 2012 festival. This week we talk about music. New music to be exact. And if you think new music means recently released albums, keep listening as we revisit a conversation I had with Patrick David Clark, who was a resident composer at the Mizzou New Music Festival this summer. And hang on till the end of the show for a Sonic ID from one of Columbia’s more memorable citizens. At 10 a.m., Lee’s is filled with the sound of music, plates clattering and food being unwrapped. About 10 volunteers are busy preparing a Thanksgiving meal of turkey and desserts. Major. K. Kendall Mathews is the mid-Missouri regional coordinator for the Salvation Army. He said this is the 24th year they’re hosting a Thanksgiving meal for low-income families. Six months after the devastating tornado hit Joplin, the community is slowly rebuilding itself. In Columbia, volunteers are working with the city’s parks and recreation department and other organizations as a part of an Urban Ecology Restoration project that aims to revitalize an area that was once home to a sewer treatment facility. Volunteers planted over 80 trees and 300 shrubs along the MKT trail on Saturday. Elizabeth Trovall went to the planting site off of Forum Boulevard to see how the project will create a lush landscape but also decrease storm water runoff in Columbia. The month of November can seem a little dreary: shorter days, colder weather and it’s still a month away from the major holidays. But it has a lot more going on than you’d think. This week’s show focuses on two things that make this month a little more interesting. November is National Novel-Writing Month. (NaNoWriMo for short.) It’s a cultural phenomenon, spread virally through blogs and forums, in which amateur writers, experts and everyone in between are challenged to write a complete novel over the course of a month. A lot of people take on this task solo, but a group in Columbia bands together every year to write novels alongside each other. Here’s their story. This week: a look at a community group in Columbia and a Sonic ID from the Benton Stephens neighborhood. At a joint meeting last night the groups approved a positioning line and logo to help facilitate their six-phase process. Today many cities across Mid-Missouri are observing Veterans Day. Columbia is celebrating the service of men and women in the armed forces. MU rededicated a restored memorial during a campus Veteran’s Day ceremony today. The stone memorial honors the 117 MU students who were killed during World War I. Last week Word Missouri told the story of a group of bookstores in St. Louis supporting each other through events like bookstore tours and literary speed dating. These events aren’t only good for booksellers – they also benefit local authors who write in niche genres and don’t have the support of an academic setting or a big-name publisher. Fortunately, the realm of social media is good to genre writers.